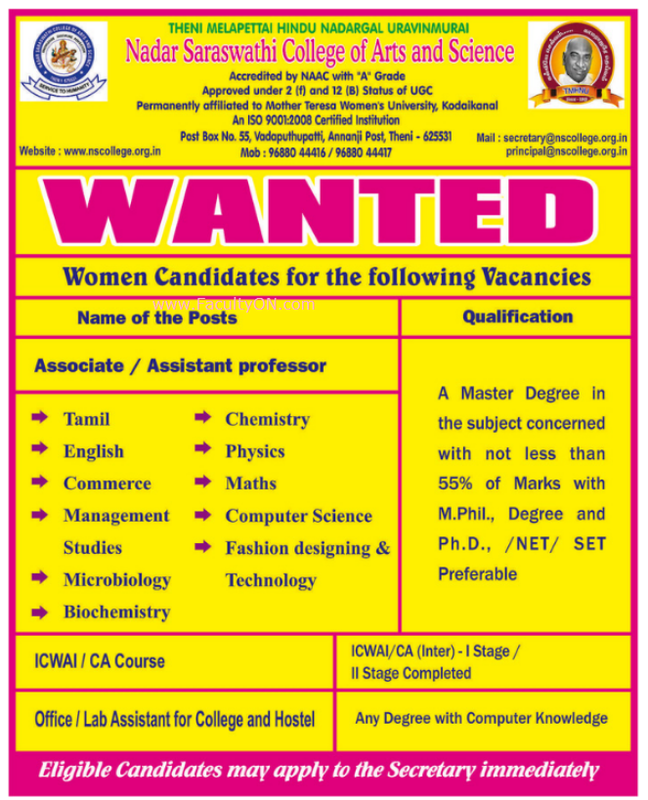 Nadar Saraswathi College of Arts and Science, Theni has advertised in the DINAMALAR newspaper for recruitment of Associate Professor / Assistant Professor Plus Non-Faculty jobs vacancies. Interested and eligible job aspirants are requested to apply immediately from 16th November 2018. Check out further more details below. About College: Nadar Saraswathi College of Arts and Science was established in the year 1996, is one of the many educational institutions nurtured by Nadar Uravinmurai educational Trust. The college is Self financing, ISO 9001: 2008 certified and affiliated to Mother Teresa Women's University, Kodaikannal. Master Degree with 55% of marks and M.Phil. Ph.D with NET / SLET will be preferred.